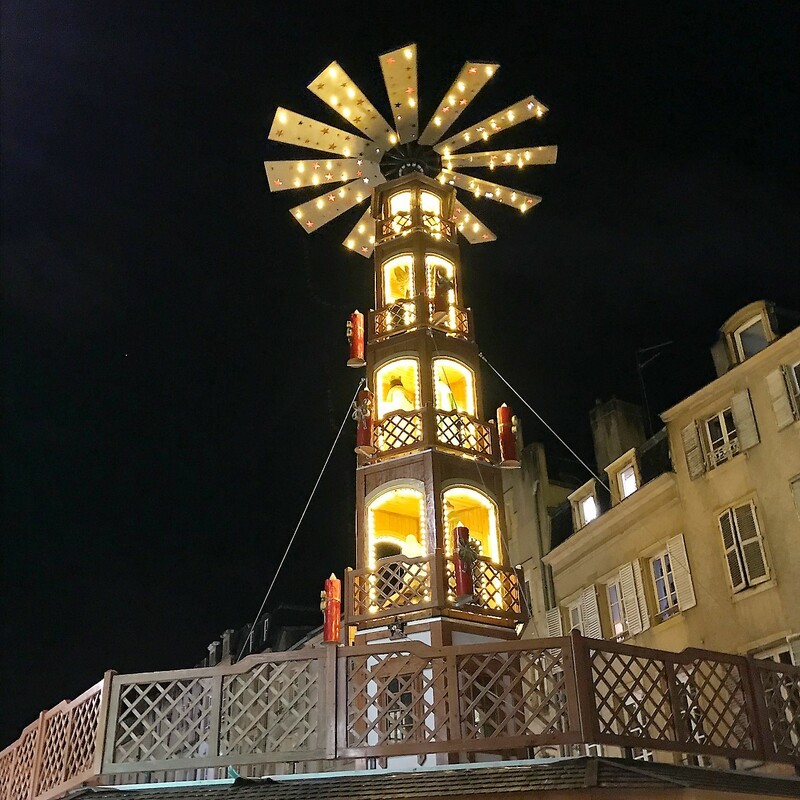 When I began planning the French segment of this trip the December timing suggested a visit the “set” of four cities in eastern France that are famous for their Christmas markets. That included Metz so I added it to the itinerary and did some reading about it but probably would have ranked it last among the four as it seemed to have the least to offer. While there for a short time this week I discovered a rich, fascinating and historical city that I’d like to return to for a much longer visit. 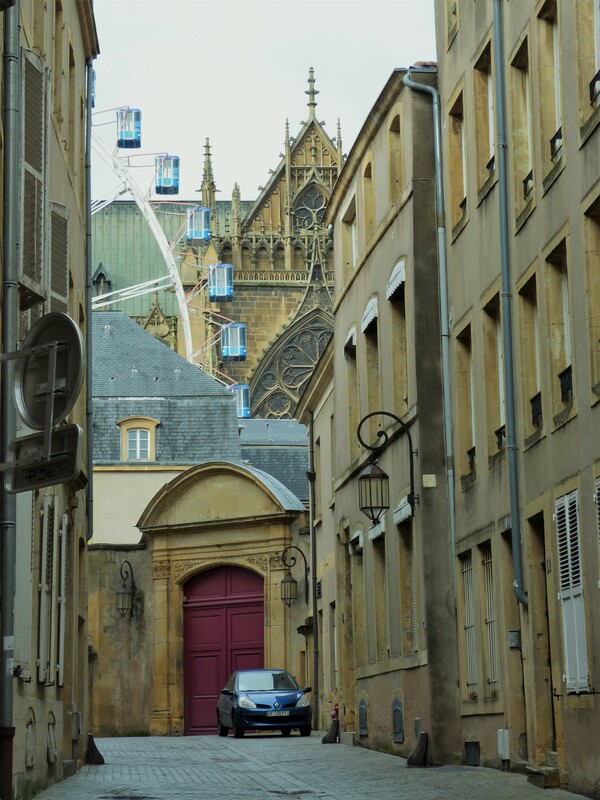 Metz through the centuries in one photo: the 13th century cathedral, the 21st century Ferris wheel (a holiday tradition in French cities), 20th century buildings and an 18th century gate. 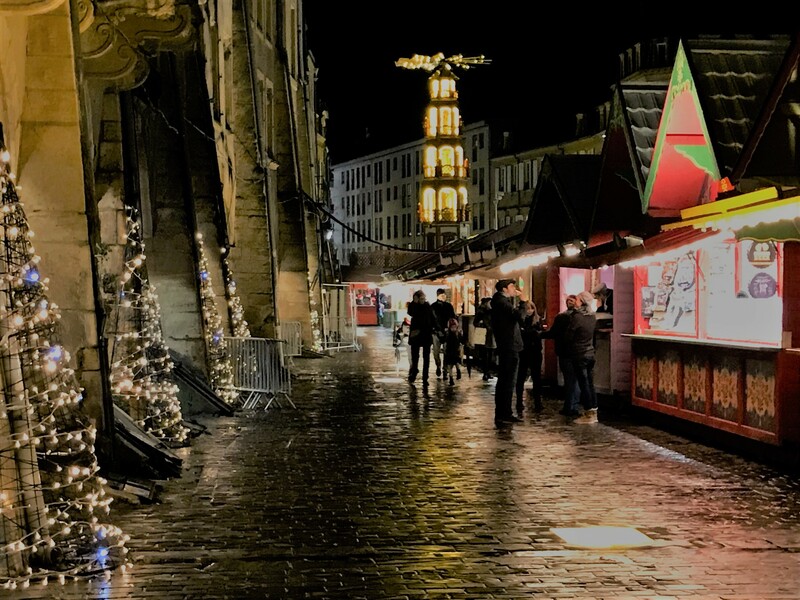 A view of one of the Christmas markets and the medieval arcades next to it, each decorated by a lighted Christmas tree. Note the tall lit structure at the rear. This is a top piece of a delightful building in the center of the market. It spins, and as it does three layers of characters from a nativity scene appear at each opening. Delightful. After meandering a while on a cold night, I chose one of several restaurants located in a row of ancient buildings connected by an arcaded passage. 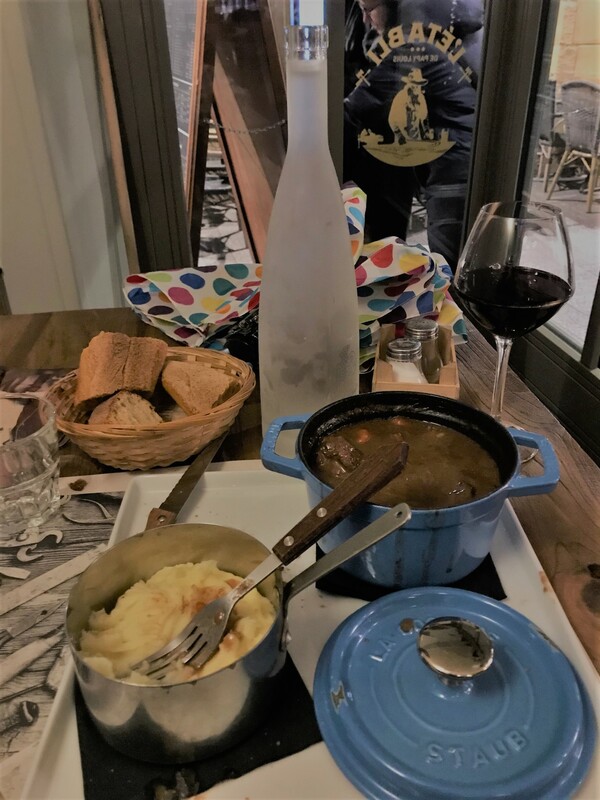 There, in a place called “L’Establi” I enjoyed a huge dinner of beef bourguignon and delicious mashed potatoes. There was much more than I could eat! A very traditional French dinner and a delicious glass of wine! The following day, Saturday, I returned to find those markets packed with visitors including Germans, Brits, and Americans as well as many French families. The old market squares are located in the center of a large commercial area filled with small shops and restaurants. One source says the shopping district in Metz is the largest in France. 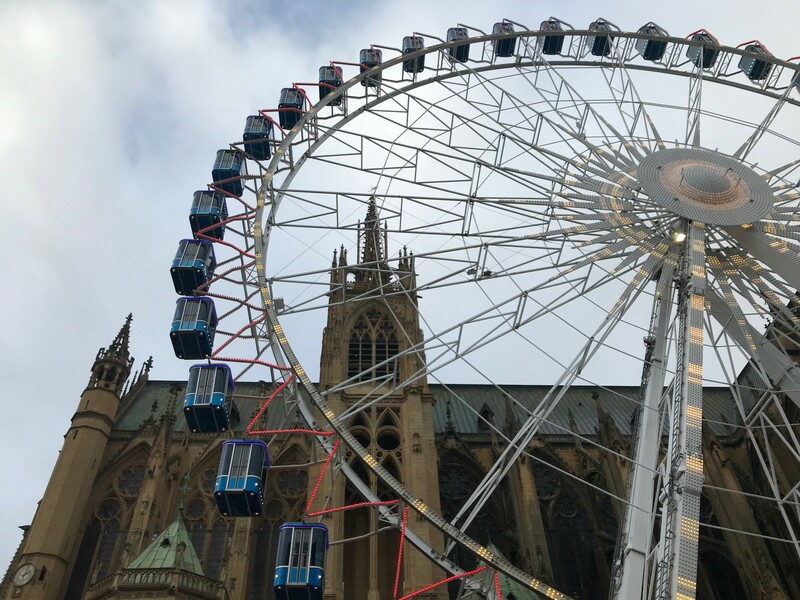 I soon found my way to the cathedral and the giant Ferris wheel located next to it for the holiday season. The oldest church in France is located in Metz. The city is filled with very old churches, both Catholic and Protestant, and a has a large synagogue. The construction of the cathedral in Metz began ca. 1220 AD and continued for about one hundred years. 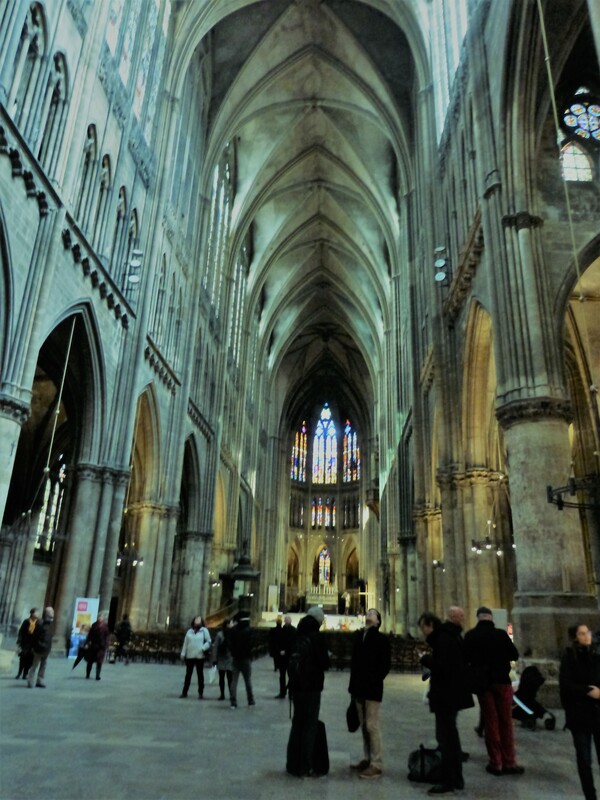 It one of the tallest gothic cathedrals in France. It also has the largest expanse of stained glass windows in the world, nearly 70,000 square feet of glass. The windows date from the 14th century through the 20th. The very tall nave of the Metz cathedral with a peak at the spectacular glass. Metz was an ancient Celtic settlement. Wikipedia says it was settled 2000 years ago; another source says 3000 years. It was from this part of France that the Celts migrated to what is now Ireland, the British Isles and Spain. Wikepedia has a detailed history of the many political changes in the Alsace-Lorraine region over many centuries. Lying as it does at the point where France, Germany and Luxembourg meet, it’s not surprising to discover that this French region has a strong German background. Following the German victory over France in early 1871, Alsace Lorraine became a part of Germany. It was only at the end of World War I that it was returned to France. It was controlled by Germany again in the early 1940s. Wikipedia has an extensive article about Metz, detailing its long history. Rough Guides “Snapshot” guide to Alsace and Lorraine, available on Kindle from Amazon for around $2. I’m on a low-budget tour so I’ll share the names of affordable places as I find them. In Metz I stayed in Hotel Kyriad for $57 a night (breakfast not included). The room was small but comfortable and the location was perfect for touring the city. I bought a tiny, lightweight computer for this trip and it’s giving me a difficult time. My apologies for the delay in updating this blog. It’s not that I haven’t been trying every day! This weekend’s New York Times travel section has a lengthy article about the Marais section of Paris. If you’ve been to Paris, you are probably aware of the Marais: the ancient section of the city just northeast of the center filled with enticing shops and enormous stone mansions built several centuries ago like the one shown above (called “hotels particulier” in French). The article in the Times details how the old neighborhood shops have been replace by trendy boutiques — like this bakery/shoestore. The article reminded me of my stay in France in January last year because I literally stayed across the boulevard from the edge of the Marais. Each morning I would rise early and go out with my camera, often before the sun rose. The light coming up on those golden stone buildings made everything shine. Often I saw fathers walking little children to school. (I have no memory of seeing mothers doing that.) I finally found the ancient market called Marché des Enfant Rouges which I’ve searched for on every visit to Paris. The market takes its name from the red clothing worn by children who lived in a nearby orphanage many years ago. The market is smaller than most. I was a bit disappointed. All this caused me to look at the photos I shot on my first extended stay in Paris, in 2004. 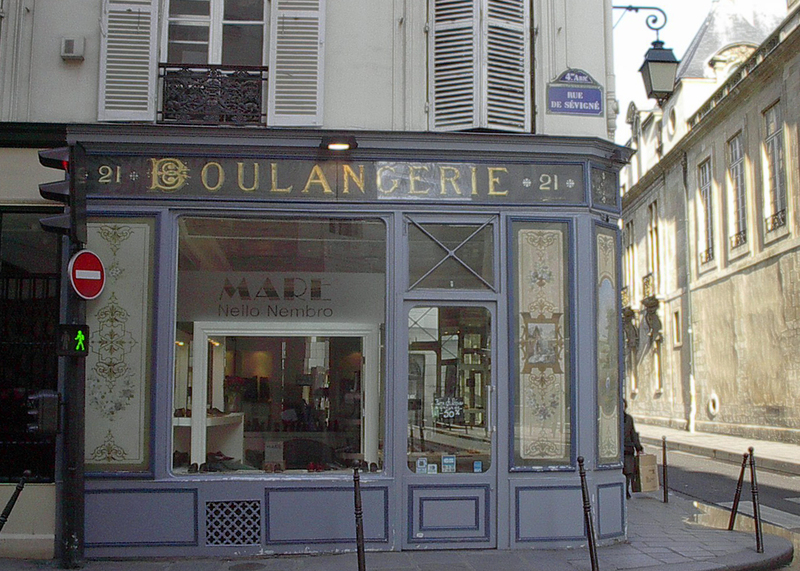 I enjoyed four tours of Paris with a small company called Paris Walks, two of them in the Marais. One of my favorite travel experiences began with one of those walking tours, led by an opera singer. Since it was 13 years ago I suppose it’s ok to tell you about it now. Our tour guide was very knowledgeable but he was also a bit nervous. He came unprepared for the weather, which threatened rain. And the rain came down in buckets! The gentleman tried to continue with the tour in the deluge, standing there with no umbrella, becoming more and more disconcerted every minute. 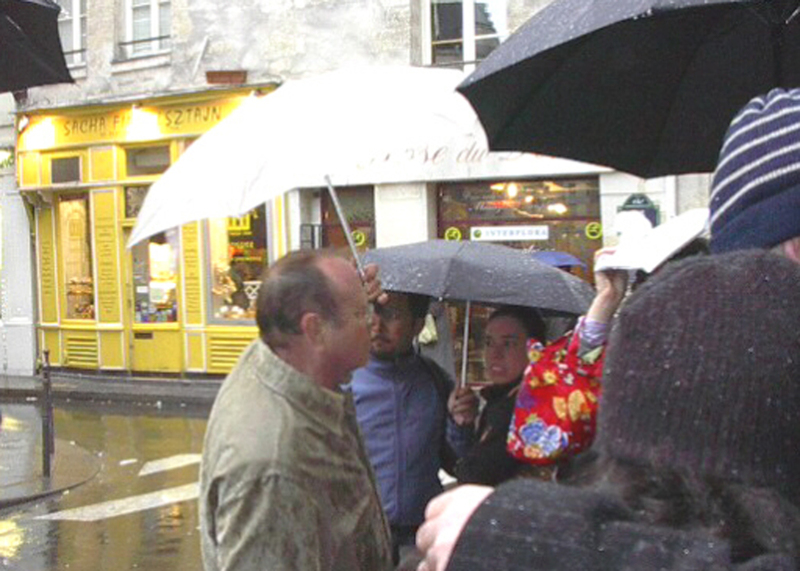 I offered to share my umbrella with him – only to have him grab it from my hands, leaving me to stand in the downpour! The guide, the group, and my umbrella. The group was small, perhaps 12 people. Eventually the tour was a washout and four of us began to explore on our own. There was a young man who was an American doctor, a young woman from New York, a librarian close to my age and me, a totally naïve traveler. 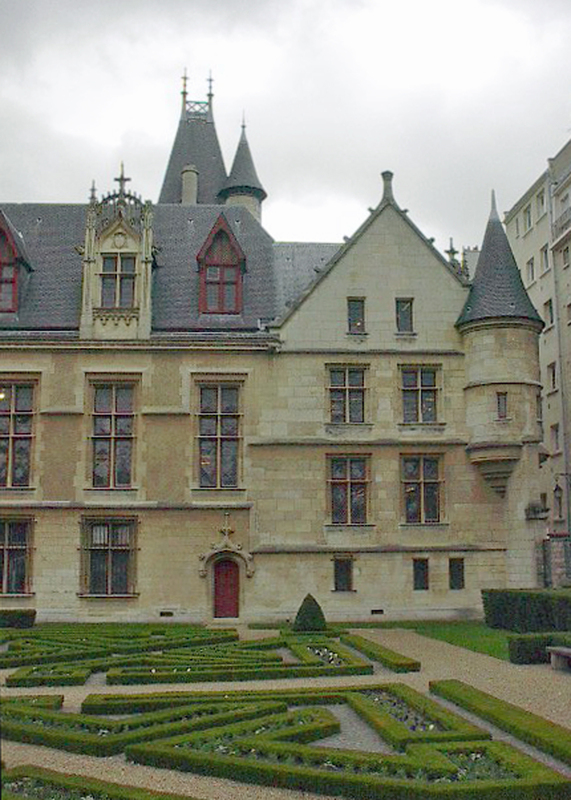 First we went to Place des Vosges, a giant square of homes completed in the year 1605. We sat at the crowded sidewalk café outside the famous restaurant, Ma Bourgogne, and drank hot chocolate. When it was decided that we were hungry we walked to a tiny restaurant on Ile Saint Louis where I first tasted paté de fois gras. (Excellent!) And drank plenty of good French wine. Fortunately for my budget, the young doctor picked up the check. The librarian happened to be staying the hotel in the Sorbonne area next to mine so she and I wandered back there when the day I’ll never forget ended. 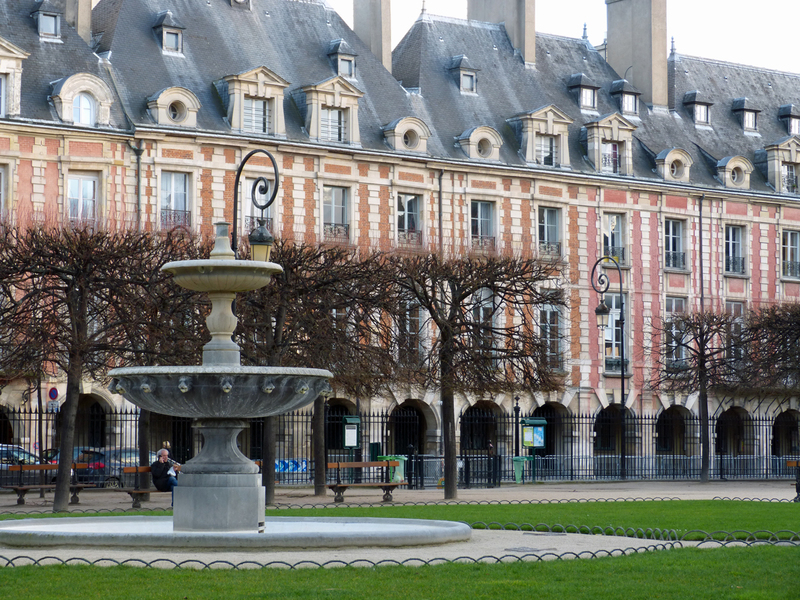 A view of one corner of the Place des Vosges, a large square surrounding a popular park. It was the sort of experience that makes being a traveler so much fun! Sometimes the slow traveler finds the best places purely by accident. One of the best of those accidental discoveries for us was the day we found Lavardin. Following a week in the Loire Valley on a cloudy Saturday morning we headed to Orleans. Along the way we discovered Lavardin, a village that has been inhabited since long before Julius Caesar conquered the Gauls and France. A beautiful garden and fine homes on the river banks. 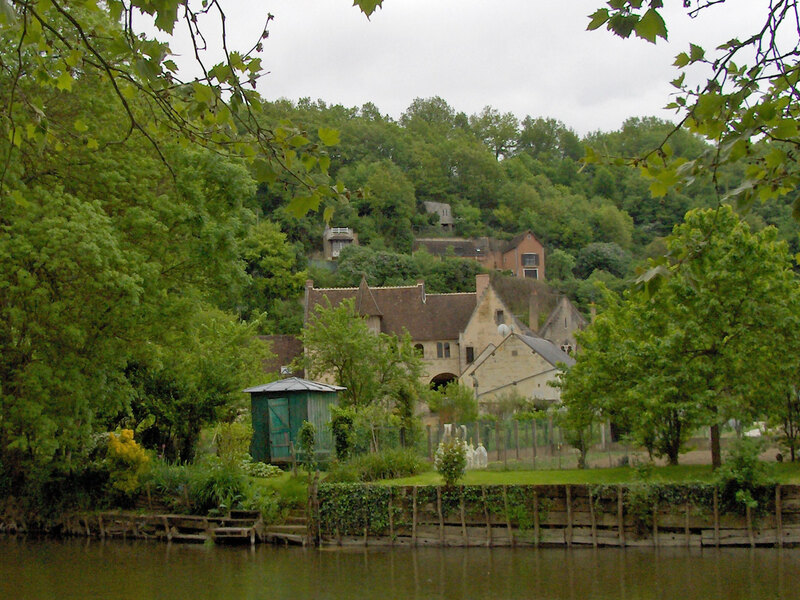 The village lies along the banks of the river Loir (not Loire, a different river entirely). An old stone bridge connects the two sides of the place, enticing us to make an unplanned stop. We saw on the high hill above the town the remains of a fortress/castle built in the mid-1100’s and largely destroyed by the French king, Henri IV, around the year 1600. 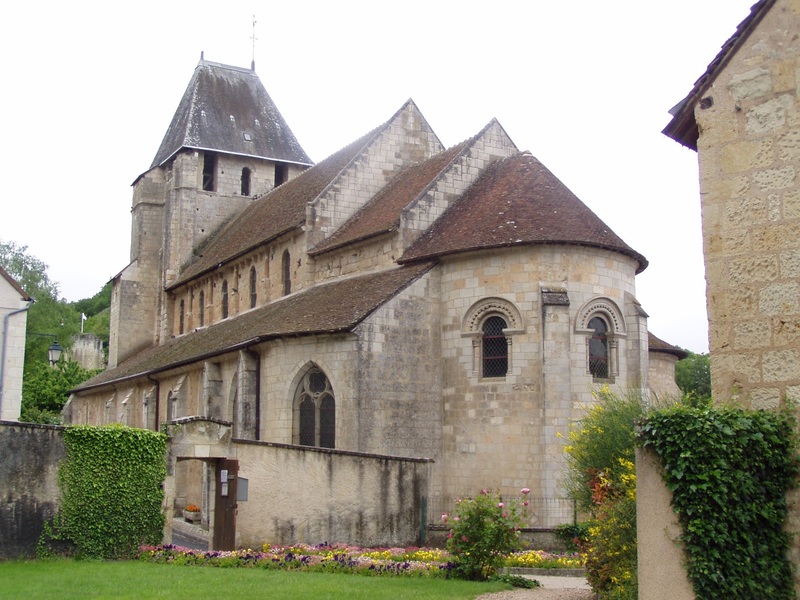 The 1000 year old church of Saint Genest in Lavardin. On this Saturday morning we enjoyed seeing gardeners at work along the banks of the river. At the bridge we found a restaurant we would have liked to try had we been there a bit later in the day. 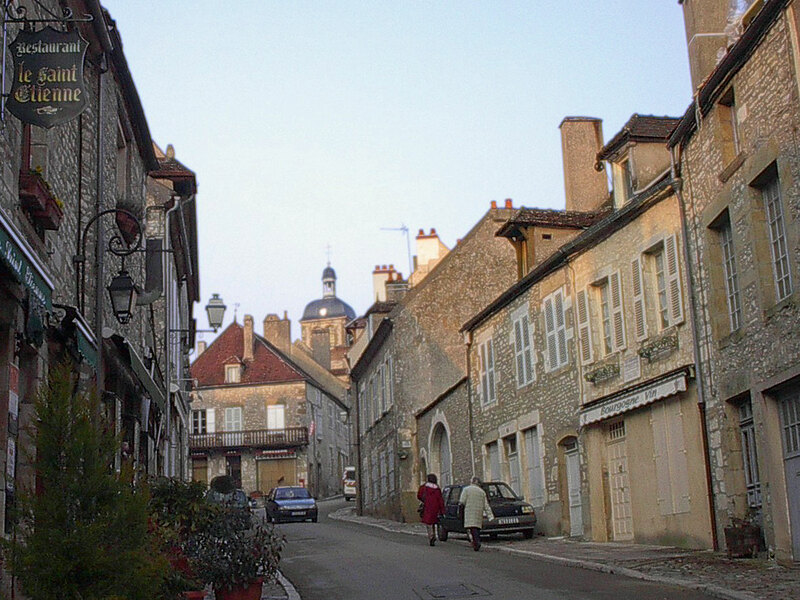 We followed the main street over the bridge and into the heart of the village where we discovered the Romanesque village church named for Saint Genest. We saw no one around the church but the door was unlocked so we entered. A glimpse of the interior of the church. 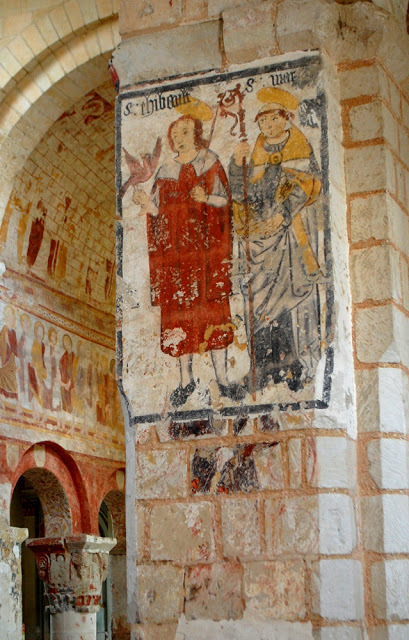 This photo is swiped from http://ateliermaisonconti.blogspot.com where you’ll find many more fine pictures of the frescoes in this church. We have wandered into many ancient churches in Europe. George was particularly fond of exploring and photographing them. But this church held a surprise for us that we’ve found nowhere else. The walls were covered in paintings that are many hundreds of years old. We didn’t have the cameras and lighting required for good photos of this marvel but I’ve found a website that will show you what we found in Lavardin’s 1000 year old church that day. Please click here to see it. The remains of the 900 year old castle stand today much as they were after King Henri IV’s knights destroyed it. Since that day in 2005 much work has been done to restore these images in this historic village church. They will continue to astonish visitors for many years to come. 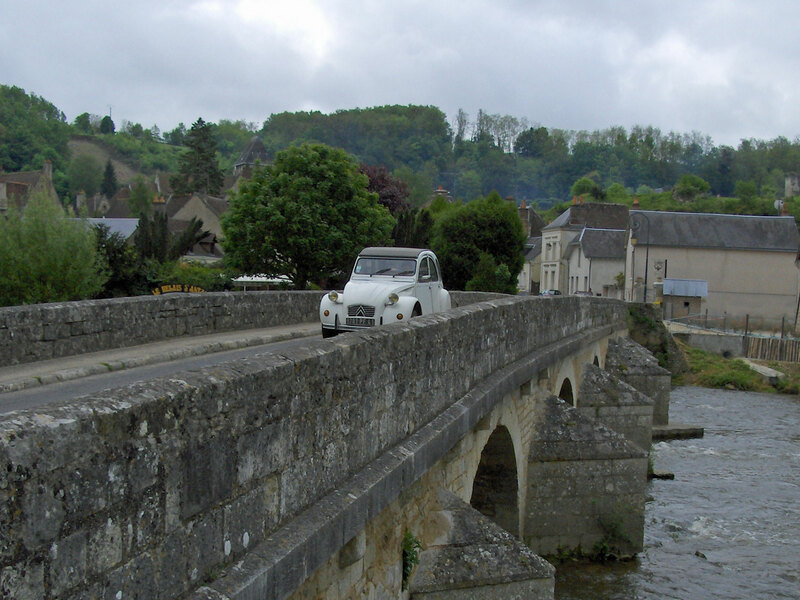 The cute old car seen in this photo is called a Citroen Deux Chevaux, a beloved relic in France. It was manufactured from the 1940s to 1990 and many of them are still running. The name means “two horses.” Citroen, the manufacturer, designed this inexpensive car for farmers who were still using wagons drawn by horses after World War 2. The village of Lavardin has an excellent website that will show you more of the village and tell you the town’s history across several millennia. Click here. For years I’ve followed the blog written by Ken, a native of Morehead City, NC. Here’s a link to his post about Lavardin’s church. The history of the Citroen Deux Chevaux courtesy of Wikipedia. 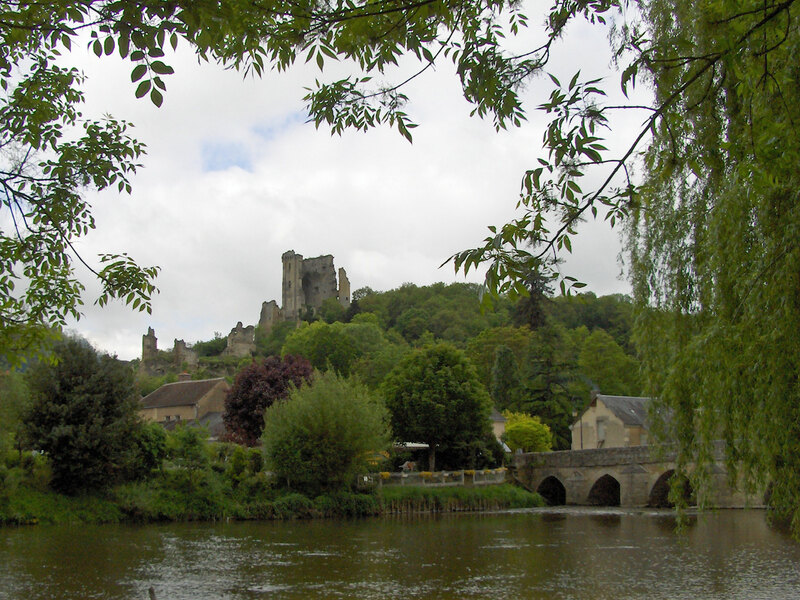 The Dordogne River winds slowly across southern France, passing centuries-old chateaux and villages. 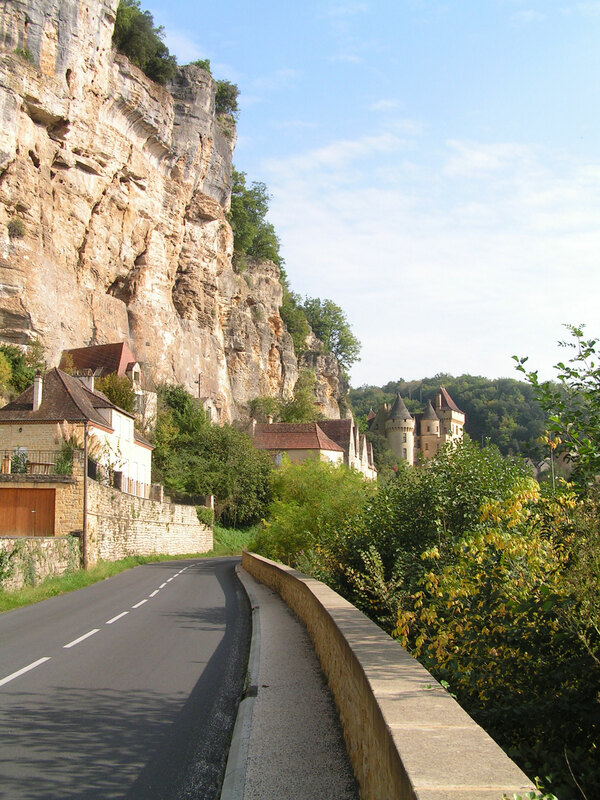 The region known as Perigord is now more often called Dordogne. Here life moves in old, gentle ways. In small villages along the river the townspeople remain well connected to one another, sharing community festivals and dinners, meeting one another at weekly outdoor markets, sharing wines, patés and brandies made from their walnuts. 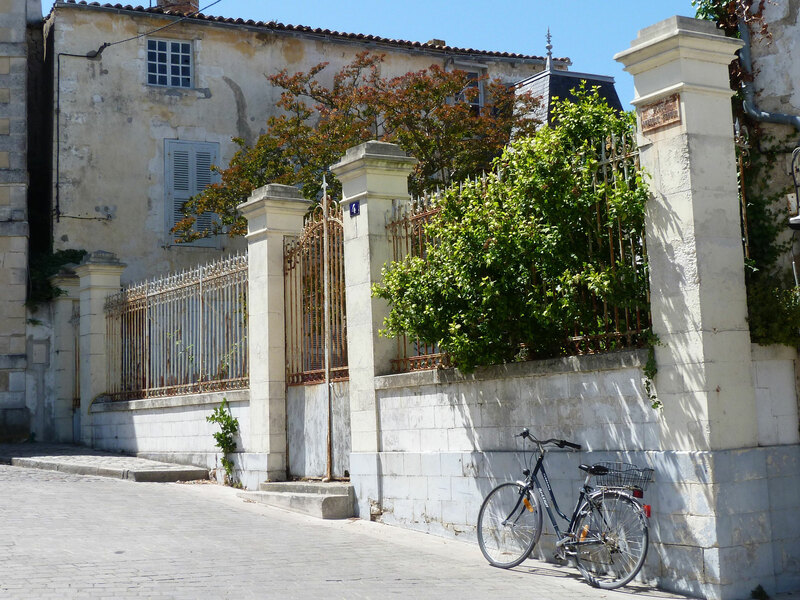 The weather in southern France is often mild in winter attracting many British people who relocate to the Dordogne region for retirement or to establish small businesses. The area is very popular with tourists who are familiar with France. Many local people, both French and British, operate B&B’s or offer vacation rentals and camping sites on old farms. Today they live together in peace but the French and the British have not always been good neighbors. The history of this region is both long and brutal. Prehistoric cavemen are believed to have lived in this area of France 30,000 years ago. The famous cave paintings of Lascaux are just 20 miles north of the Dordogne river. Two-thirds of all the cave paintings known to exist are in southwestern France. Richard the Lionheart was killed in a battle here in 1199. Between the years 1337 to 1453 the two countries often fought over control of southwestern France in what is called the Hundred Years War. Relics of war can still be found across the region in the form of ancient fortress-castles. 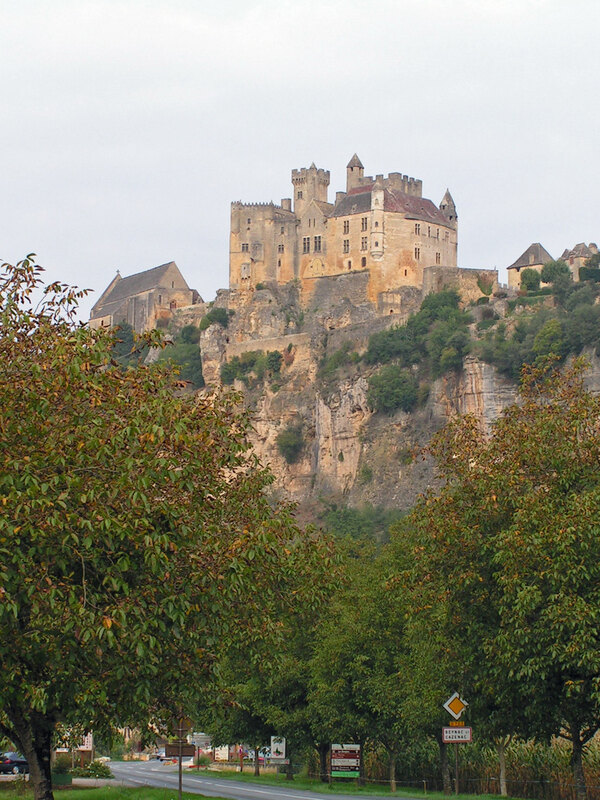 Two of these chateaux crown the neighboring villages of Beynac-et-Cazenac and La Roque-Gageac. Battles were sometimes fought between these fortress-castles which are only three miles apart. 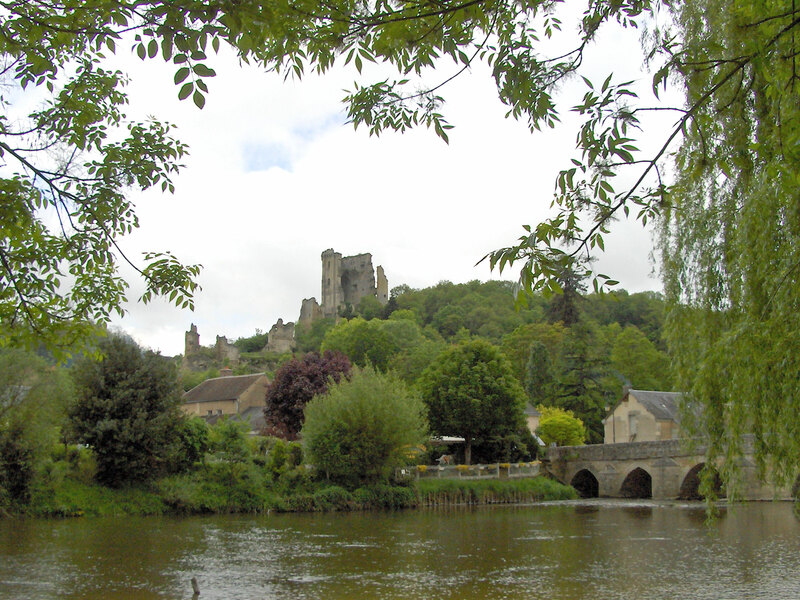 Today these peaceful places are members of association called The Most Beautiful Villages of France. Each village is comprised of houses built of golden stone centuries ago. 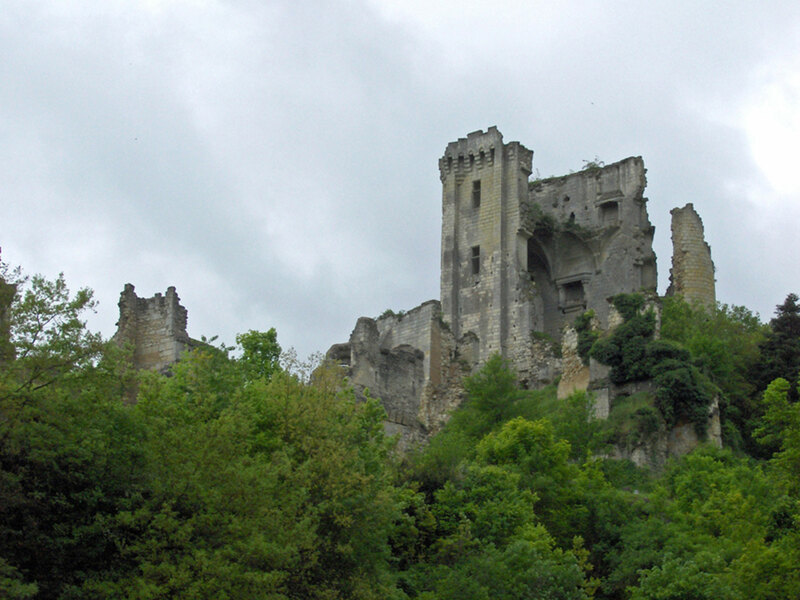 An ancient chateau still stands at the top of each town. The chateau at Beynac is open year-round for tours. 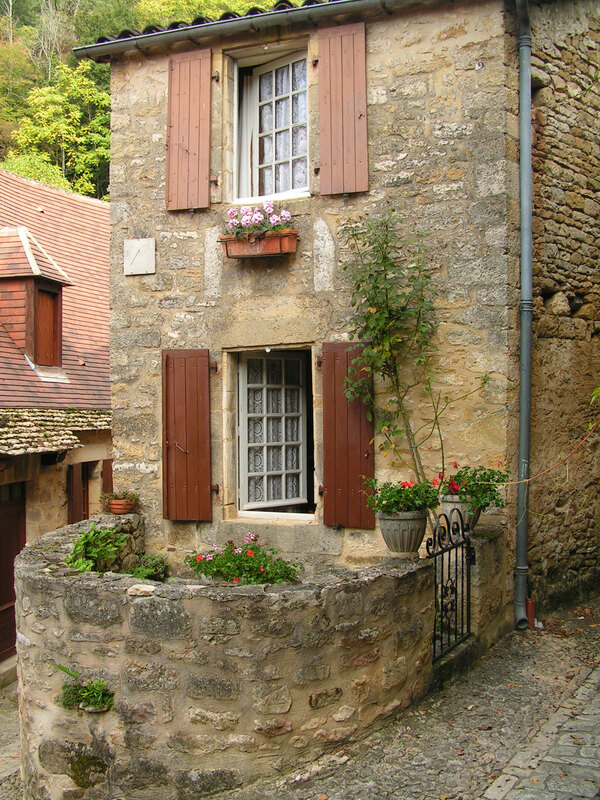 The houses in Beynac are stacked on the steep hills and cliffs above the river, the foundation of one at the roofline of its neighbor. The homes in La Roque-Gageac have been sandwiched between the river and the cliffs that run beside it. Each of these villages is the site of fine restaurants and vacation rentals. Boating and camping along the river is easy to arrange. 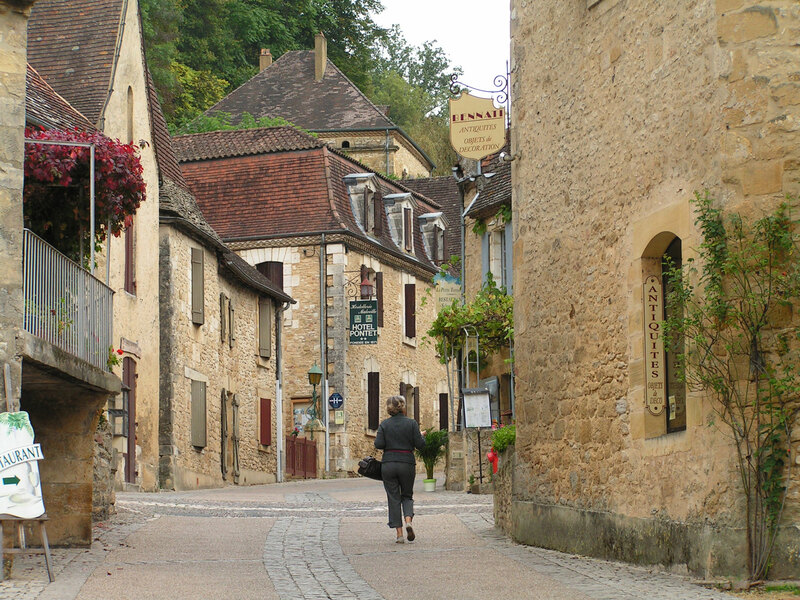 The atmospheric old town of Sarlat-le-Canéda is just twenty minutes away. Here are some pictures George and I took a few years ago when we explored this part of France. I look forward to returning. Beynac is so steep that this street runs along the roofs of the adjacent houses. Can I please live in this house in Beynac? 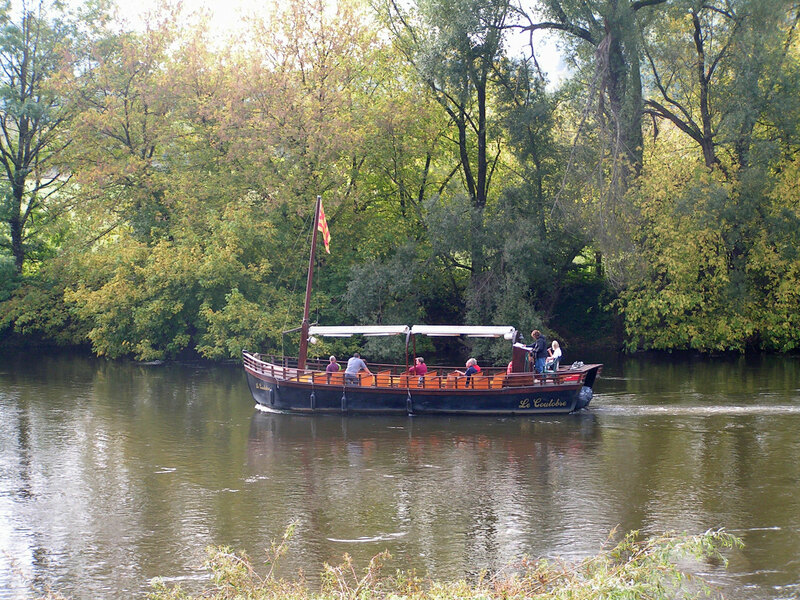 Tourists enjoying a ride on the Dordogne river. 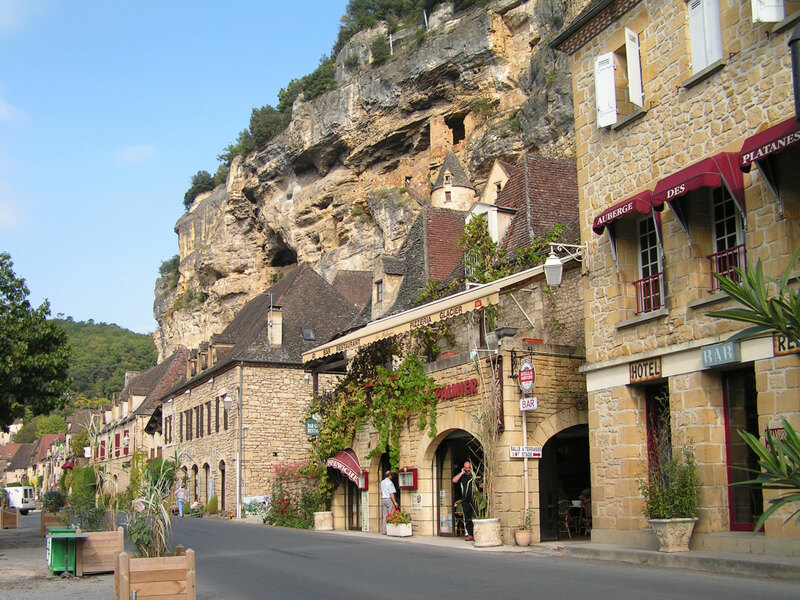 Buildings stand between the river and the cliffs in La Roque Gageac. Think you might like to know more about visiting Begnac and La Roque? Here’s a good site to begin with. My friend Elinor and I have discovered a series of novels set in the Dordogne region of France. Elinor’s much more discriminating about what she reads that I am so I feel safe recommending these to you. The series begins with a book called Bruno: Chief of Police by Martin Walker. I’ve read all but the latest one and find Bruno and his friends to be very likeable. 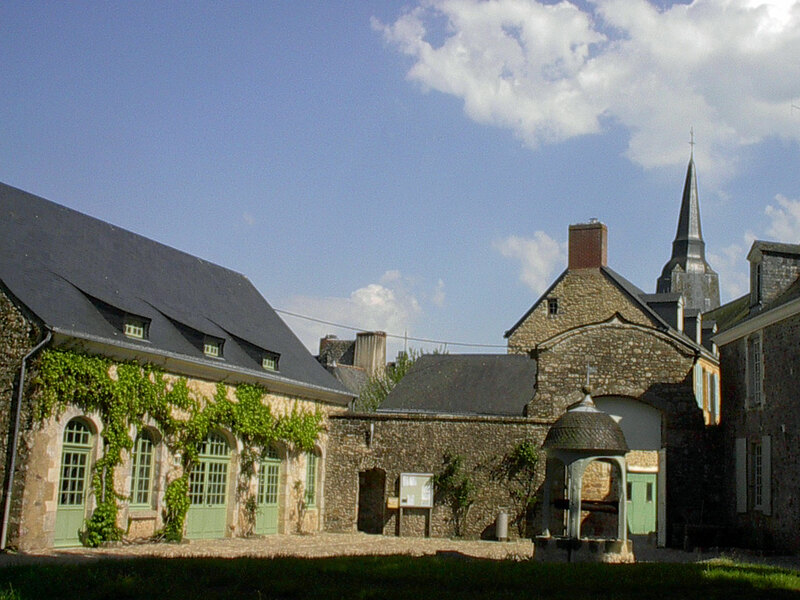 The name refers to the chateau which has been perched above the village for more than one thousand years. 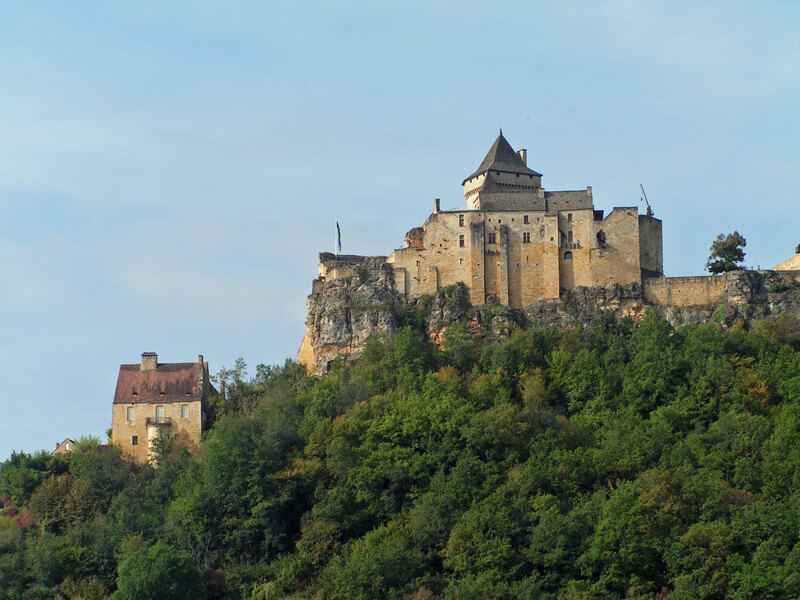 Built as a fortress, the castle was abandoned in the 16th century and stood unused until 1973 when Fernand Pouillon, an architect, began its restoration. Today the chateau is open for tours during the summer season. Learn more about it here. One rainy morning a few years ago my husband George and I wandered around the village with cameras in hand. I had learned of the beauty of this tiny place from references on the web to the excellent small hotel and restaurant there, the Hotel du Vieux Pont. 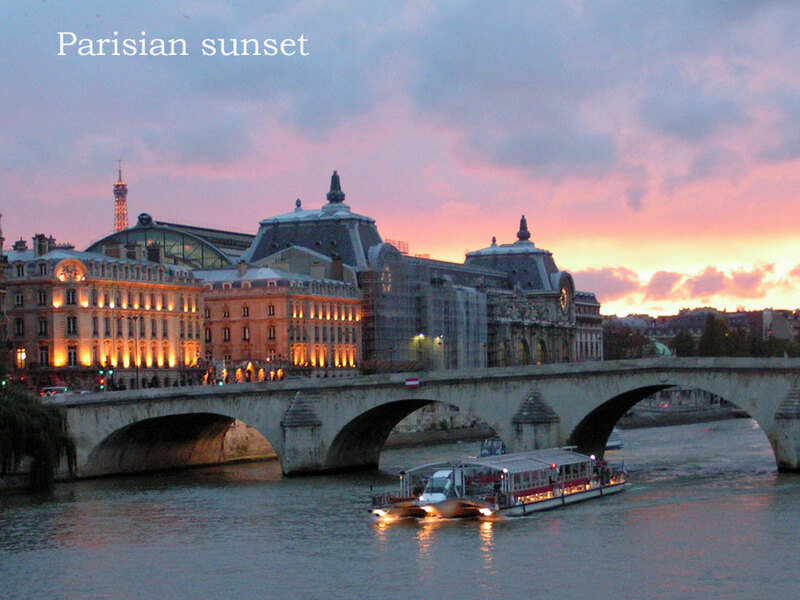 (The name means “hotel by the old bridge”.) We didn’t have time then to experience this well-recommended place but I hope to do that in the near future. 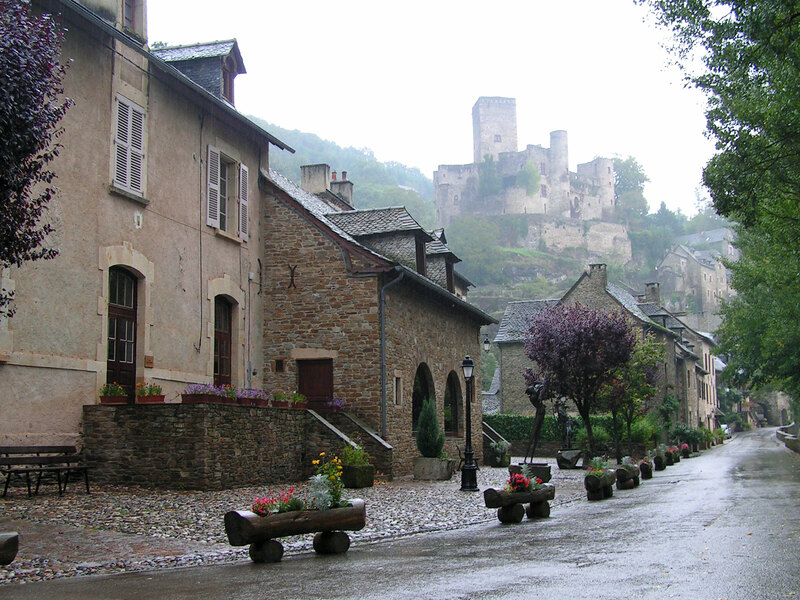 Here are some rainy-day images of a perfect French village. The façade of the Hotel du Vieux Pont in the town of Belcastel. It’s a small, 3-star hotel with a fine restaurant. This photo has been “borrowed” from the website of the Chateau of Belcastel. Hope they don’t mind my sharing it with you. Wet scene of the street below the chateau. 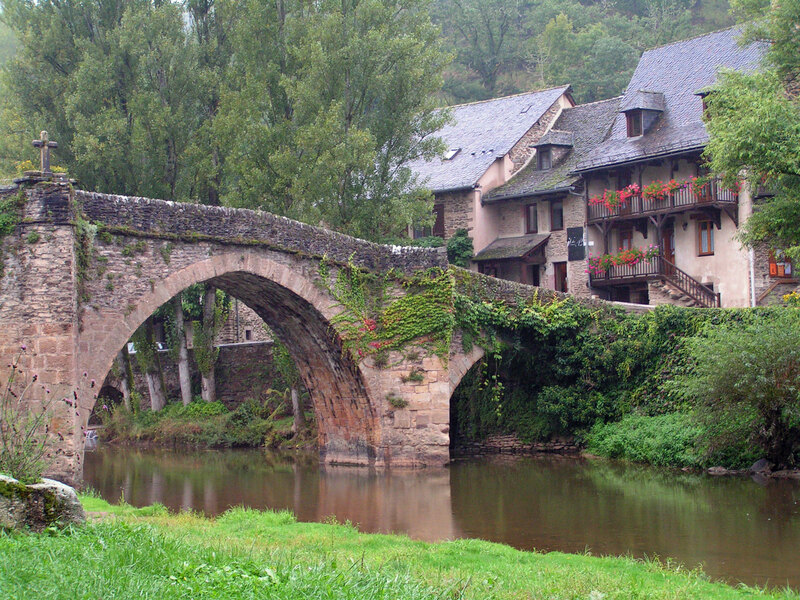 The bridge built in the 1400s leads to the church — also built in the 1400s. Things last a long time in the countryside in Europe. 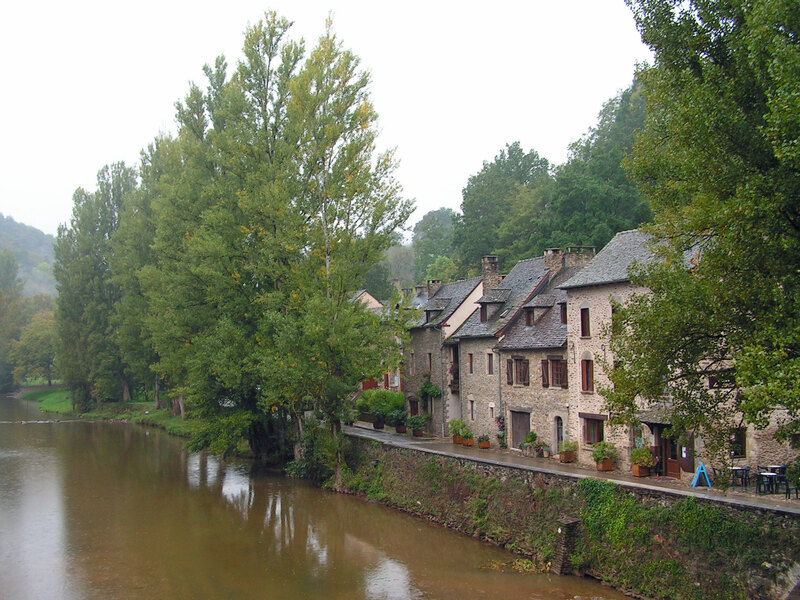 The Aveyron river divides the village. Upon entering the village called Conques in southern France the visitor enters the middle ages. 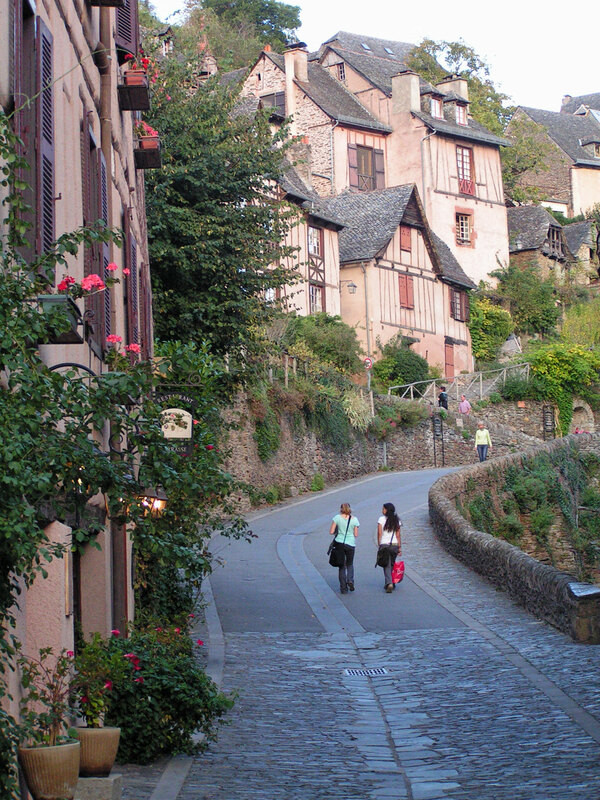 Located high on a mountain in the region of Aveyron, Conques (pronounced Konk) has remained virtually unchanged for centuries. The village is thought to have been founded by a hermit named Dadon in the 6th century A.D. but it may be much older. A small abbey grew in the place where Dadon lived. To become successful medieval abbeys needed to possess an important relic to draw pilgrims and their wealth. 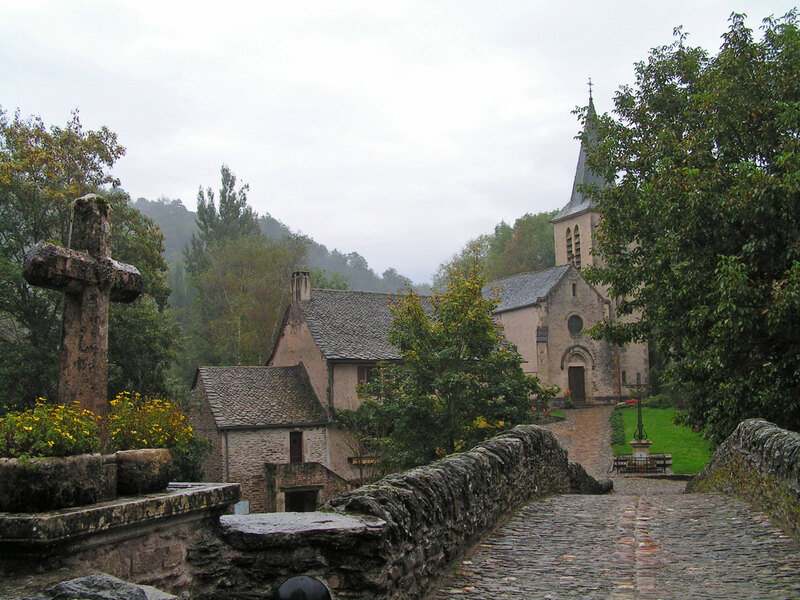 At Conques, the “draw” was the remains of Sainte Foy. 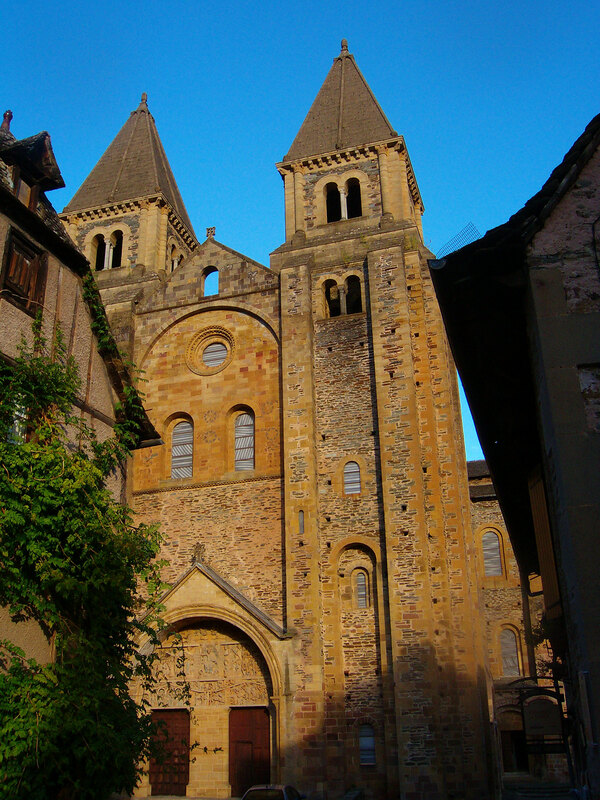 In the 9th century a monk from Conques was sent on a mission to the abbey in the distant town of Agen where he acquired (by nefarious means) the remains of the young Christian martyr named Foy (French for “Faith,” pronounced “fwah.”) It is believed that Sainte Foy was tortured to death ca. 300 A.D. for refusing to denounce Christianity. It was said that her remains were miraculous. 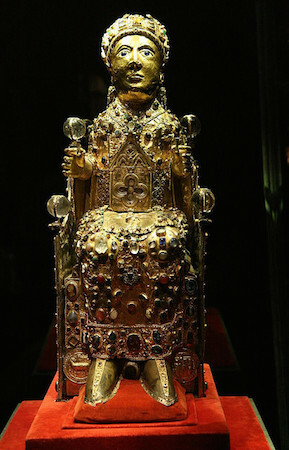 Many pilgrims journeyed to Conques to pray to Sainte Foy and to leave gifts of money, precious metals and jewels to her. Over time the abbey became wealthy. Click on this photo to see an enlarged view. One of the links at the end of this post provides a detailed description of the sculpture. In the early 12th century the abbey church that is the center of the town today was built. The abbey lies on one of the pilgrimage routes from Paris to Santiago de Compostela in northwest Spain. It is built solidly of blocks of golden stone. There are two bell towers flanking the door. 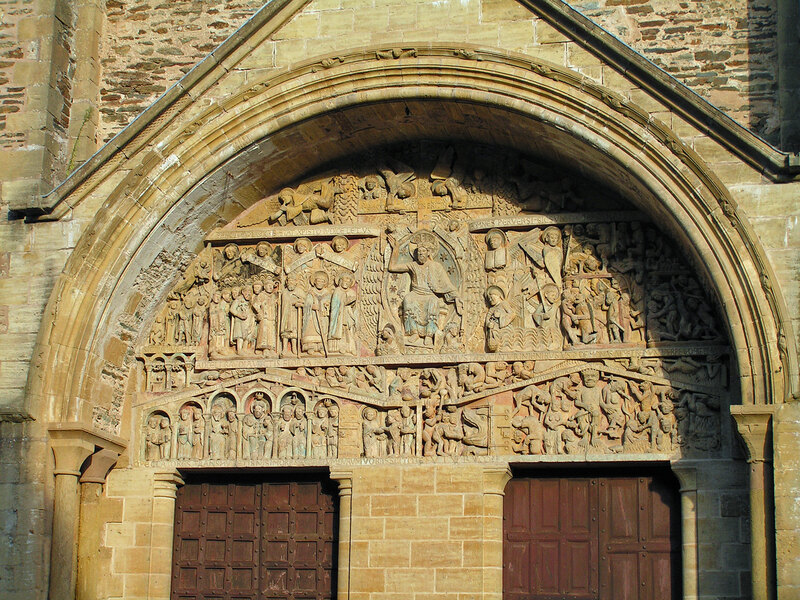 Today the abbey is best known for its tympanum, the sculpted decoration above the main entrance. It’s believed to have been created ca. 1150 A.D. Traces of centuries-old paint can easily be seen on the sculpture. The photo below will show you its intricacy and a link at the bottom of this post will explain the meaning of the images. The interior of the abbey church in Conques. This sculpture, believed to represent the builders of the church, always makes me think of the early Beatles. Today the village (population under 1000 people) hosts thousands of pilgrims and hikers as well as many tourists. A book entitled The Little Saint by an author writing under the pseudonym “Hannah Green” first drew my attention to Conques. 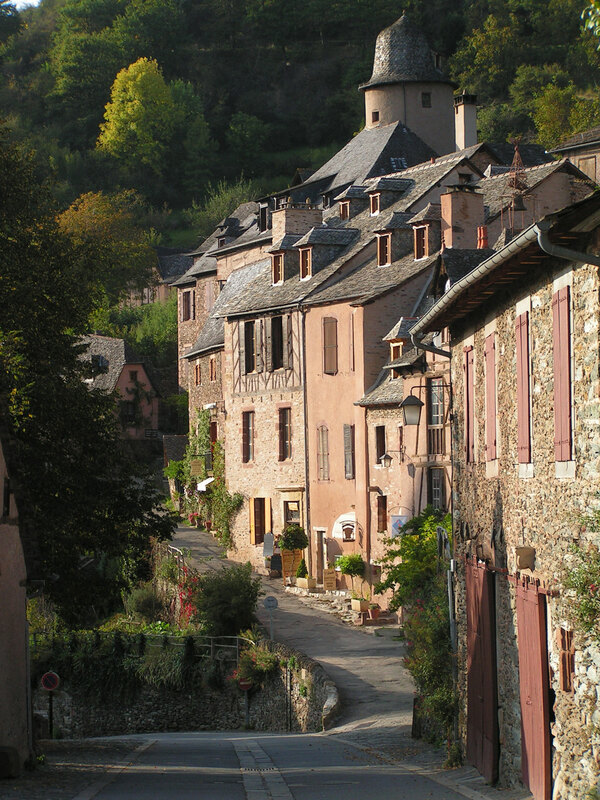 Ms. Green wrote about her summertime visits there in the 1970s, describing the people of Conques and her explorations in the hills above the village. Houses are stacked one above another on a hillside. One street just wide enough for automobiles winds through the village but all the other “streets” are simply ancient tracks twisting past houses that are hundreds of years old. 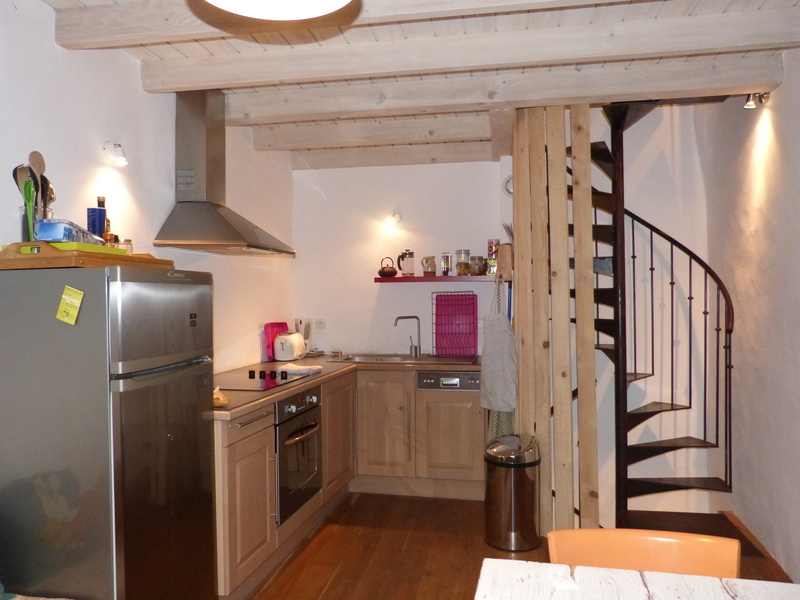 There is a large hostel for pilgrims only, a small hotel and some “chambre d’hotes” (French for a B&B). We stayed at the original village hotel where we enjoyed a fine dinner and a lovely room overlooking the surrounding mountains. In the morning we wandered through the village as the sun came up and made an early purchase in the boulangerie (bakery) across from the hotel. For me, visiting Conques was an accomplished travel goal. I thoroughly enjoyed my time there and hope to return one day. 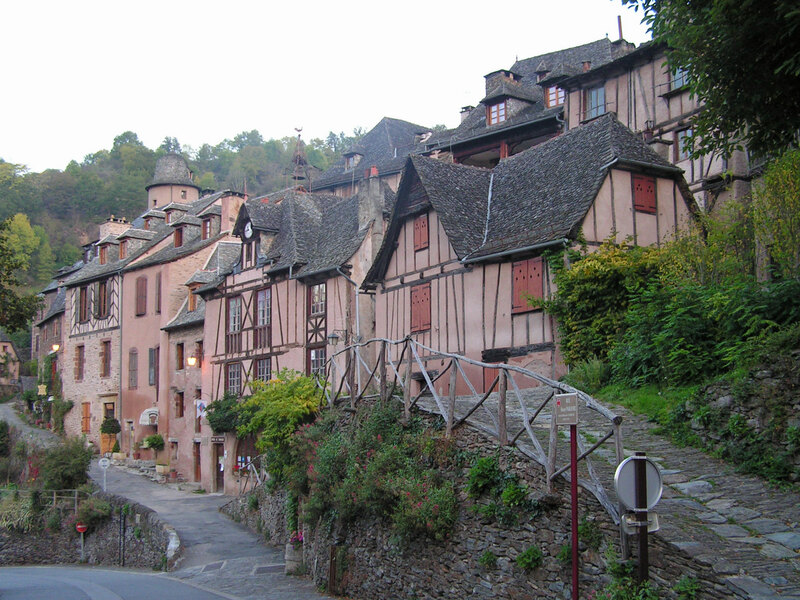 Images and a description of Conques from the association of Most Beautiful Villages of France. 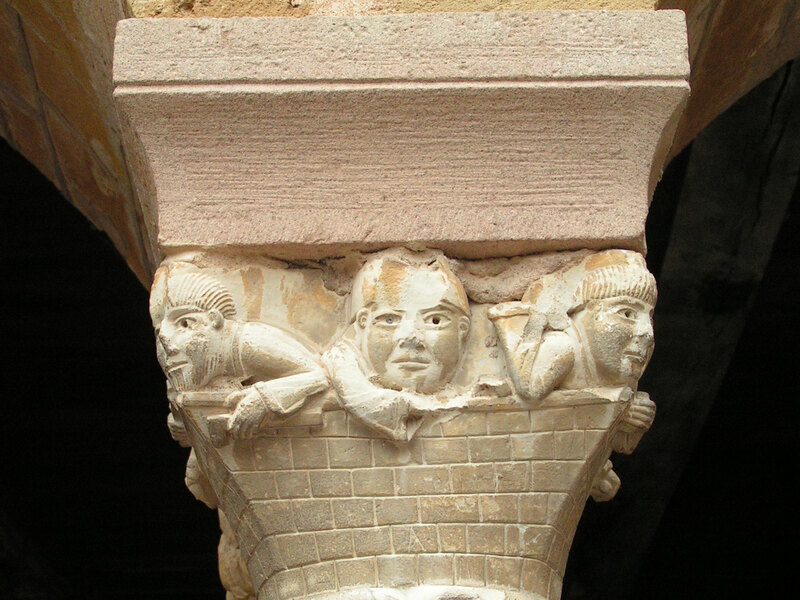 Another very good online tour of Conques and its church. A very detailed description of the abbey church and its sculptures by a professor of art history. 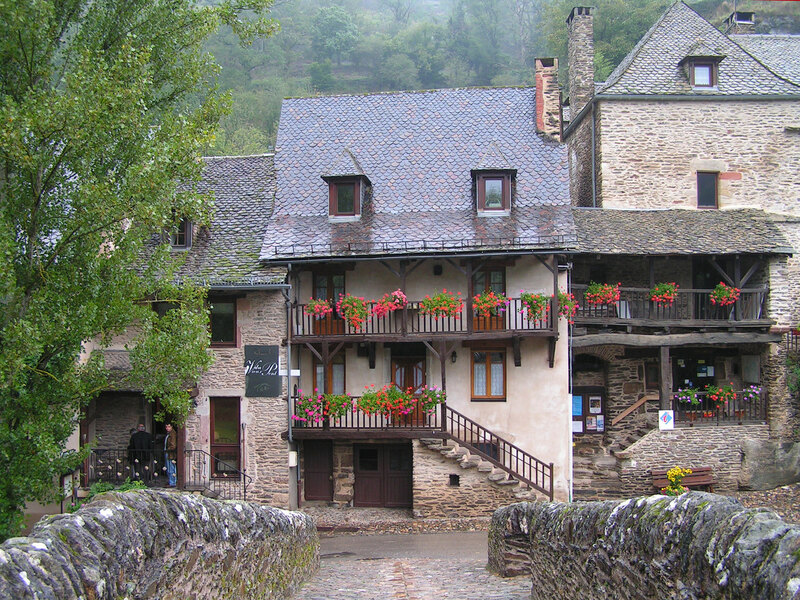 A link to the oldest hotel in Conques, where we enjoyed staying. 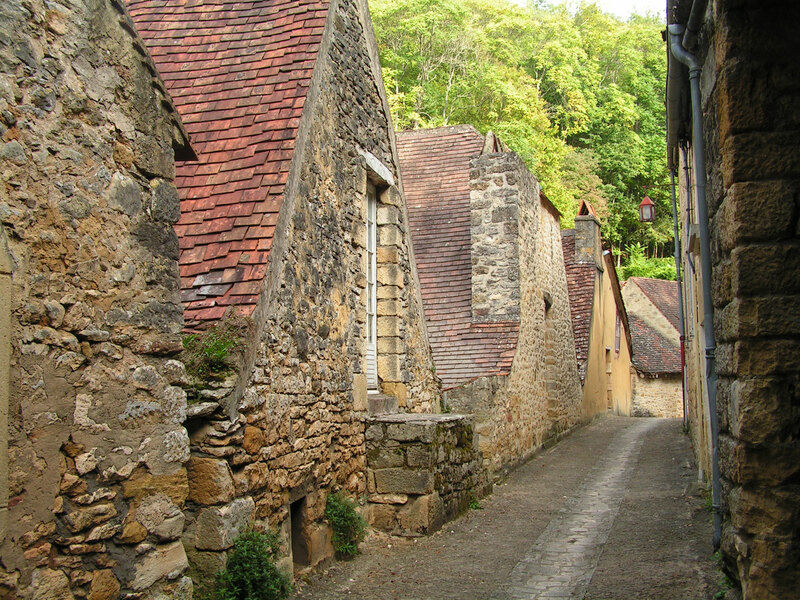 The countryside of France is littered with ancient villages. Each one is centered around a centuries-old stone church. Some of them have an ancient open-sided marketplace. Nearly every city and village in France has a town hall (called a “mairie”) and many villages have at least one small restaurant or inn. History lives in these tiny hamlets but in most of them there are few full-time residents. In the early 1980s, in an effort to encourage preservation of the best of these places, an association was formed. In French it is called “Les Plus Beaux Villages de France” (the most beautiful villages of France). That organization has been very successful. Today there are 154 member villages located across France, from the mountains of the east to the beaches of the southwest, from Brittany in the northwest corner to Provence in the south. A visit to any one of them is a journey back in time. A village’s admission to the association is not easily acquired. In addition to being exceptionally beautiful and representative of its part of France each village must have fewer than 2000 residents and be the location of a least two recognized historic sites. Upon applying to join the association, a village is studied carefully before its membership is approved. Once admitted to the association, a village must continue to meet the high standards of the association. The village of La Flotte is one of two “most beautiful villages” located on the Ile de Ré on the western edge of France. The other is Ars-en-Ré. The island is very popular with French and English tourists during the July and August vacation months and prices are high. In the other ten months of the year it is less crowded and more affordable. It’s a wonderful place to visit. 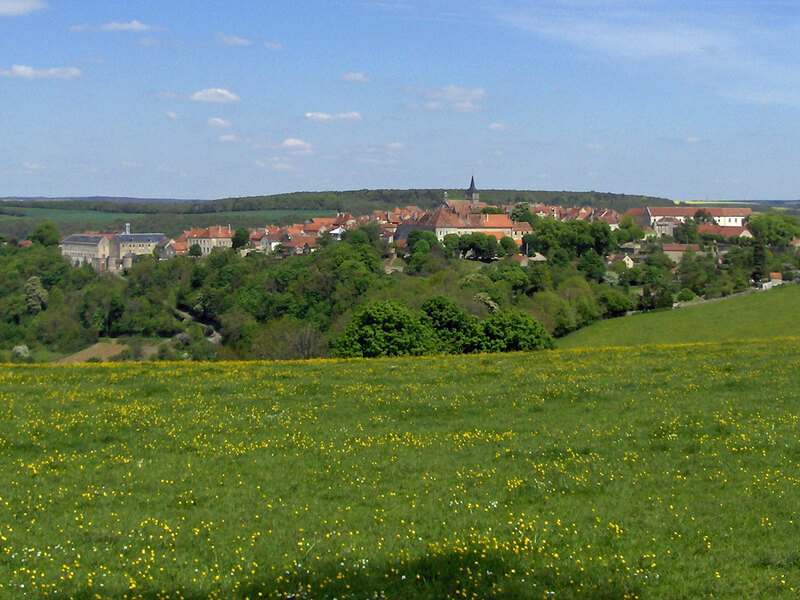 The tiny village of Flavigny-sur-Ozerain in Burgundy was the setting of the movie “Chocolat” starring Juliet Binoche, Judy Dench and Johnny Depp and released in 2001. If you’ve missed this one and you love France, find the DVD! 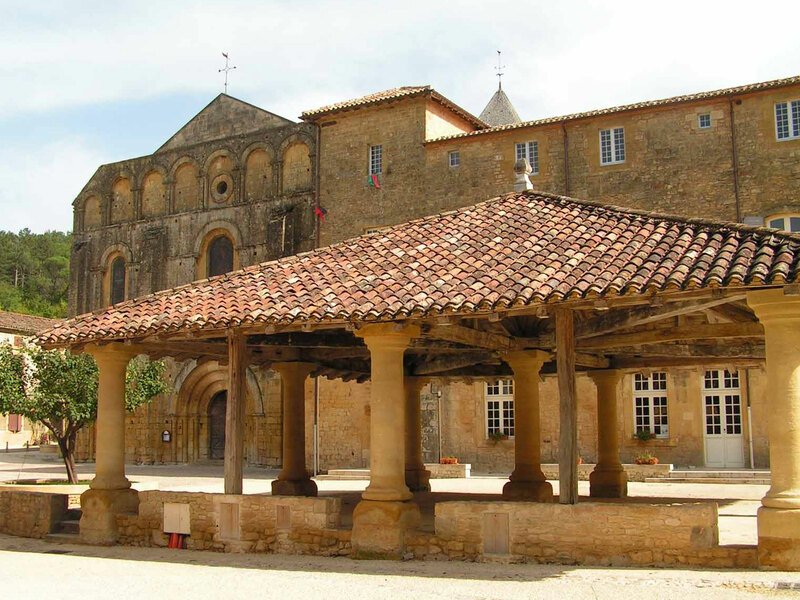 Vezelay in Burgundy is the site of one of the most important medieval abbey churches in France. 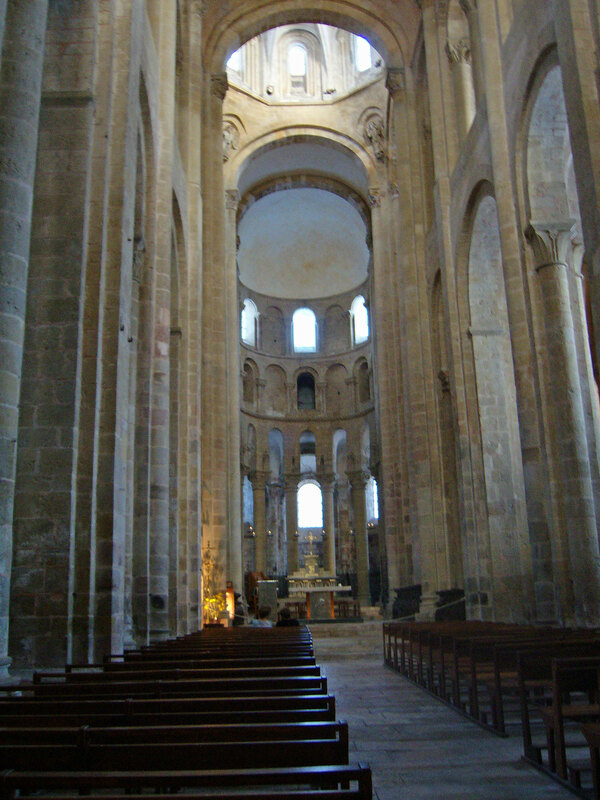 From this abbey church Eleanor of Aquitaine and her young husband, King Louis VII of France led the second crusade. Located in western France in the region called Pays de Loire, Sainte Suzanne is a tiny walled village that has been brought back to life by a major restoration project. Lavardin, a Loire Valley village, surprised my husband George and me when we discovered it by accident about ten years ago. A ruined castle overlooks the town. Its thousand-year-old village church should be on every history-lovers “bucket list.” I’ll write more about this soon. 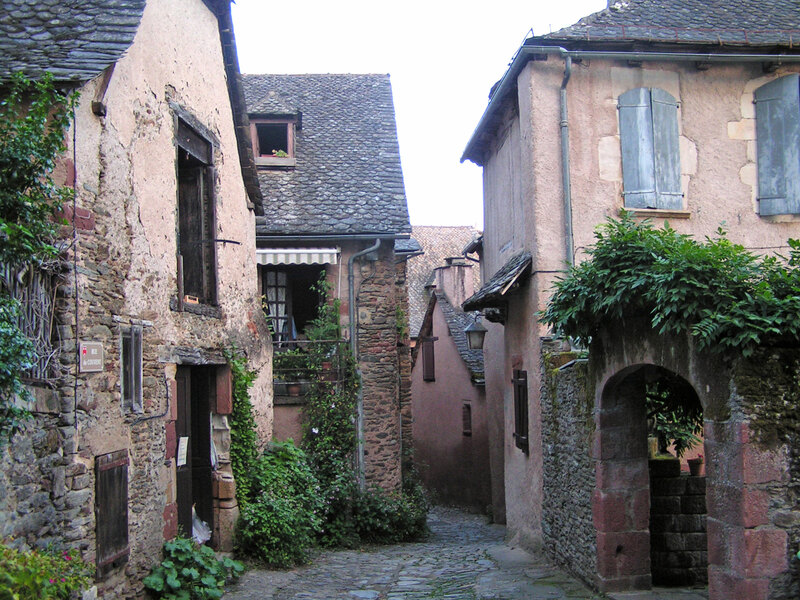 If you have a favorite village in France I hope you’ll tell us about it in the “Comments” section below. Is Going to the U.K. or France on your wish list? 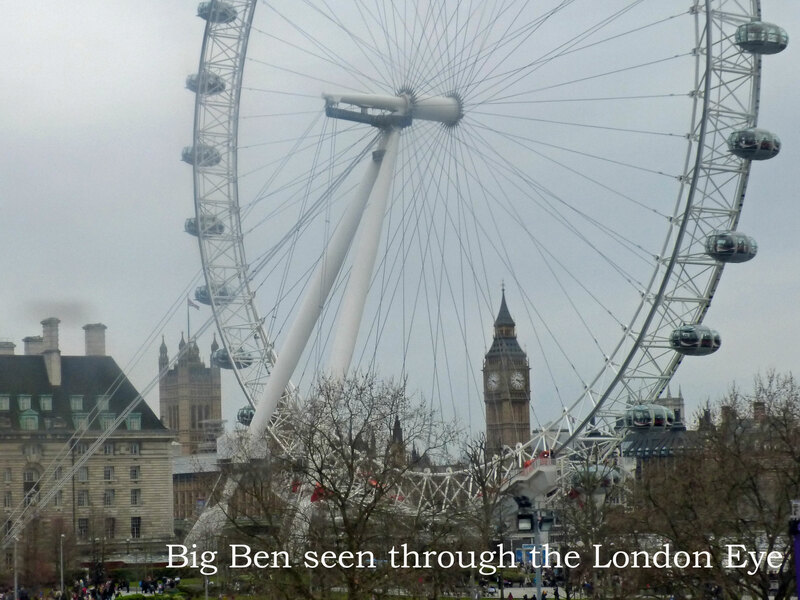 If you have a hankering to visit Britain or France, this may be the best time in years to go! The U.K. vote to leave the European Union (“Brexit”) has caused a large drop in the value of both the British pound and the euro. Currently a euro costs $1.11 and the pound is $1.31. (These are today’s prices, August 31, 2016.) The recent terrorist attacks in France and Belgium have caused a significant reduction in the tourist numbers in those countries resulting in some lowering of hotel prices. For much of the past ten years the euro has cost around $1.35 or more and the pound has been between $1.40 and $2. London and Paris are among the world’s top tourist destinations and I think everyone should see each of those magnificent cities at least once in a lifetime. I enjoy them but I find that exploring the countryside and the small cities and villages in those countries more pleasant. Not only is that kind of travel less expensive, but it’s also more relaxing and it allows you to really meet the people in those countries and to discover how they actually live. In today’s issue of The Guardian, a major British newspaper, there’s a terrific article about non-hotel places to stay in “back-to-nature” places where you can enjoy a stroll, a bike ride or a leisurely drive in a rental car. Here’s the link. Also from today’s news, the Washington Post has an article about one family’s discoveries for seeing Paris cheaply. Here’s that link. If visiting England or France (or both, which is easily done via the Chunnel) has been on your wish list, this autumn may be a less expensive time to go than we’ll ever see again! Be sure to read the previous post. Here’s a link. Click on an image to make it larger. When you do that you may be able to see these images as a slideshow.